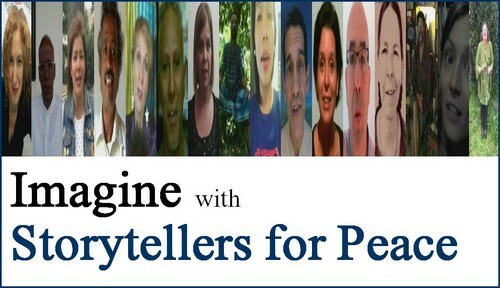 After Rudyard Kipling’s If, here is the new video by Storytellers for Peace. The General Assembly has declared this as a day devoted to strengthening the ideals of peace, both within and among all nations and peoples. This is the way we imagine to build blocks for peace. 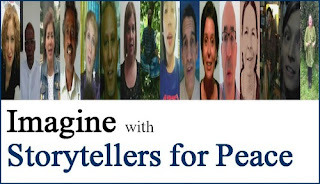 Sixteen storytellers from fourteen different nations, speaking in their first language, tell their personal dream of peace for their own countries, from their point of view. The collective video is made of different hopes for a peaceful world, all together as a wonderful puzzle, each one important for the best of all. Imagine a world with other laws. A world where no evictions. Where people have work. Can you imagine walking through other crosswalks? Imagine no human being goes to bed hungry. Those who are thirsty can drink clean water. Those who are sick can access medical care. Everyone should have an opportunity to work. I imagine the kids of Venezuela all playing in freedom, listening to stories beneath a Saman tree, in shade, with their families, because a hug of peace is not a story. Let's distribute love. Let's multiply love. Let's add love. But we let's not deduct love. I would like to see my country more inclusive. A country where we recover the confidence to be calm and peaceful. A country where values reborn. A country where people may truly be happy. I imagine a country where in the very first place there are human rights, in the second one… human rights, and in the third? Yes, human rights. If we’ll still have time for others it will be beautiful, otherwise, I will love it the same. I imagine, one day, waking up in the morning, going for a walk in the streets and find every single person, children, youth and elder, smiling from ear to ear, so that they make you smile too. Imagine, there are no extremism, killing and bloodshed in the name of religion in Bangladesh; man and women both are equal; and all human being are honored as a human being. As a Filipino, I dream of a peaceful Philippines full of love, unity and cooperation. I imagine peace through tolerance - not just tolerance of people who are different from us, but a tolerance of ambiguity and uncertainty, because there is so much we do not and cannot know - about the universe, science, nature, God, spirit, change, the future, and the inner lives of those around us. When we can accept ambiguity and uncertainty, there can be empathy… and peace. I imagine a country where all decisions and laws are always made suitable for children. That is the only way we could be certain that peace would reign forever. Imagine a world where we could imagine, in which we could dream, drink, play dress, sing, draw, write, love. A world where we could daydream. Imagine there is no violence in the world, neither physical, nor psychological, nor sexual violence. Those who raise their hands in violence will turn to stone. Imagine all arms are banned, as well as all arms manufacturers. They grow organic vegetables instead. Imagine all children are going to school to learn in peace and freedom. Those who hold them back, who puts them in a box, who grades them will turn to guano which will be spread on the school lawn. Imagine there is a war, but no one shows up. Imagine Portugal. Imagine the waves of Portuguese sea, vibrating as music notes that always play for peace. Imagine a world where children are children and have time, time to play, that is the best one. That time they have loose, free and not caged inside a clock. And imagine a world of stories, cartoons and novels but not working with a button. I would like a grandmother in her nightgown telling and reading me that. I imagine Australia to embrace diverse cultures. I imagine Australia to welcome and care for refugees. I imagine Australia to better understand Aboriginal cultures. As always, please, subscribe, like, share the clip and mostly our hope for a better world.